I am a big movie watcher. This Imp enjoys all style movies, but especially foreign and independent films. This Imp has been suckered into Netflix and recommends it highly for movie watchers. I recently got the Memoirs of a Geisha movie thinking I would check it out and see if it was good. Let me tell you.....oh.....my....goodness! I will own this movie. In my humble but correct opinion this movie is awesome. It is not spectacular for its awesome graphics. It is not awe-inspiring because of its fight scenes. It doesn't even have a lovely piece of eye candy to enjoy. It is just a very very well written, well acted, well filmed movie that I hope becomes a classic in some fashion. Suzuka Ohgo, who plays the main character as a child was a very good actress, she played a very good serious role for such a young person. Plus she did not speak a lick of English yet all her lines were in English, which she had to learn. As an amatuer actress that impresses me. Now to Ziyi Zhang who plays Sayuri, or the main character as an adult. She made this character real. I am not usually one to be swept away in dramas (believe it or not) but I was totally enamored from the beginning til the end of this movie. I oft' time do other things while watching a movie but I just sat there in an almost catatonic state watching as I was pulled into the story and felt with the characters until the end. Even the love story interwoven was one of reality and not so much Hollywood froofroo. I have not watched the special features yet, but have been told that because of the different nationalities respresented in this cast, there were many interpreters that had to be used. An amazing feat this director accomplished in making such a well done movie with such obstacles to overcome as multiple language barriers. I know from being assistant director in the play here at home (more on that later) that even when you do speak the same language sometimes it is a pain to get everyone on the same page, but mutliple languages....oy! Needless to say in this Imp's opinion this movie is a must see! Just make sure you are in the mood for a drama. I beg to differ, while I liked the movie, there is eye candy in this movie. The main character is smokin' hot. Other than that I agree with your synopsis. 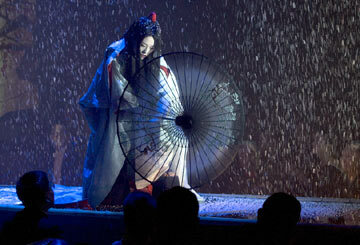 However, I thought the movie raised more questions than it answered regarding teh geisha. My questions were nothing a quick trip to Wickipedia couldn't fix though. I have watched two crap movies you should stay away from. Tristan and Isolde and Casanova. Both were horrible. Well now I will have to see this movie, which was on my list of things to see already anyway, though your intelligence gives it another star in my book. And if we want to talk Eye candy, Heath Ledger, mmm and that voice too, made Casanova easily watchable. Now its no Seabiscuit or Hotel Rhwanda, but it was good fun lite as air popcorn fare. fyi...the book is sooo much better than the movie! i really loved the movie! but the book was tons better! so if you have the time, i definitely suggest checking out the book! but yes, i totally concur with all your comments about the movie. the actors made this movie!